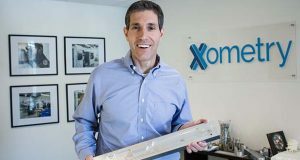 Gaithersburg manufacturing platform Xometry acquired a competitor and raised $25 million, the startup announced Tuesday. Xometry acquired Lexington, Kentucky, firm MakeTime. Xometry provides an on-demand manufacturing platform designed to allow its customers to find an appropriate place to create their goods while providing instant quotes and recommendations. The platform’s customers range from startups to larger customers, including BMW and General Electric. The acquisition of MakeTime allows Xometry to grow its network of manufacturers from 1,100 to 2,300. The combined company will keep offices in Maryland and Kentucky. At this point last year, the company had around 5,000 customers and about 500 partner manufacturers. It now has more than 10,000 customers. As part of the acquisition, MakeTime founder and CEO Drura Parrish will join Xometry as an executive vice president. MakeTime investor Foundry Group led the $25 million funding round. Other participants included Almaz Capital, BMW i Ventures, GE Ventures, Highland Capital Partners and Maryland Venture Fund. To date, Xometry has raised $63 million across multiple rounds. Tagged with: venture capital Xometry Inc.